Captivating ball gown 89198 from Vizcaya is a stunning choice for your Quinceanera. This stellar gown showcases a cap sleeve bodice adorned with sequins, lace appliques and beading with a high illusion neckline and lace up corset back. 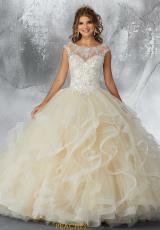 The long, full ball gown skirt has ruffle tiered layers of tulle with horsehair edging and lace beaded appliques. Matching Bolero Jacket.